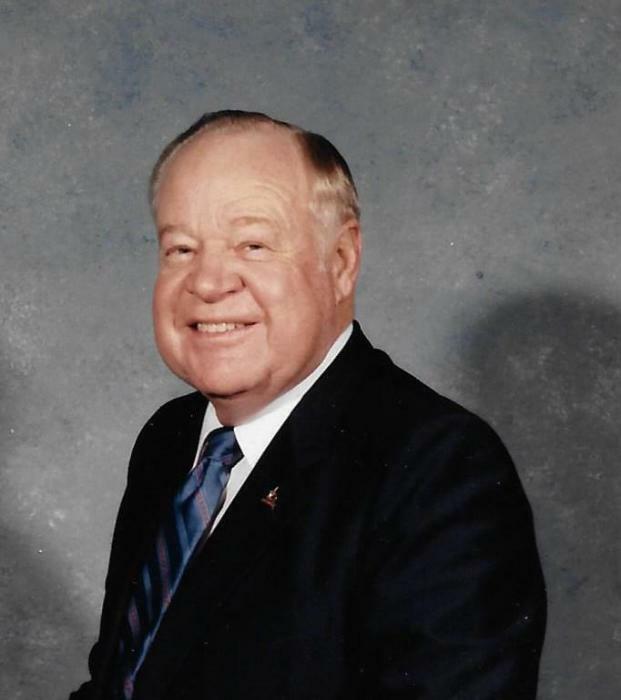 Obituary for John E Schmook | Lanman Funeral Home, Inc.
John Emmett Schmook was born on December 14, 1928. His parents were John Anthony Schmook and Cora Faye Keiffer Schmook. He was born in Cherokee, Oklahoma. He graduated from Jet Public Schools, then he attended Oklahoma State University. He met and later married Mary Luella Merrell Schmook on October 9, 1948. They met when they attended the Passion Play. On the way home, he was sure God had spoken to him that Luella was to be his wife. Moving to the farm south of Jet they lived and worked until they felt they must change occupations at which time they returned to OSU and completed a BS degree in agriculture. Upon graduation, John was offered a job with Met Life in the area of real estate appraising. Appraising became his life long career. They had four children during these years. They are John Lynn Schmook, Alan Merrell Schmook, Helen Faye Wylie and Chris Ray Schmook. He moved through several different companies before he opened Schmook Appraisal Company which became one of the leading commercial appraisal firms in Oklahoma. He was named News Maker of the Year in 1967 for revealing facts about corruption in the state highway department. In short, he became a workaholic. This led to his second life. He was saved by Jesus Christ in 1970 after his life began to fall apart. This was his second life and eternal life. Through a Lay Witness Mission at his Methodist Church in Yukon, Oklahoma, he found that God loved him and people loved him. This was not part of his experience to this point. Church was important, but a relationship with God was unknown even though some members of his family did have such a relationship. Grief from the loss of Chris Ray and a marriage separation were some of the things that were healed. He then experienced the Baptism in the Holy Spirit to further his closeness in his relationship with God. Following this opening he began to teach the Bible in Bible studies and to minister through the Holy Spirit as directed, in his work of appraising and by association with the organization of Full Gospel Businessmen’s Fellowship. This led him as an international director to minister in 50 countries and most of the United States. Many were saved, healed, counseled, filled with the Spirit and mentored. He had written two books that explained various aspects of all of his life. All the while his business continued to prosper, and he became a donor to many Christian organizations. After Luella passed away in 2010, he entered a new phase of life. Suffering through much loneliness and some health issues, he met the new love in his life. Joyce Lee Coleman Wylie added Schmook to her name on July 26, 2015. They were happily married until his passing. They joked they were married 114 years. John is preceded in death by his parents; sisters; first wife, Luella, and son, Chris Ray. He is survived by his wife, Joyce; three children; five grandchildren; seven great grandchildren and one more on the way. He has many people who call him a spiritual father or grandfather. It is truly a glorious family. John went to be with Jesus on March 22, 2018. He entered eternity after a short illness during which he was rejoicing that he got to send Joyce and his daughter, Faye on a trip to Israel. Visitation will be Monday, March 26 at 6:00 p.m. to 8:00 p.m. at Moore’s Southlawn, 9350 E 51st, Tulsa. A memorial service will be 2:00 p.m., Tuesday, March 27, 2018, at World Outreach Church, 8863 E 91st, Tulsa. Viewing will be Wednesday, March 28, 2018 from 10:00 a.m. until 12:00 p.m. at Lanman Funeral Home in Helena followed by a graveside service at 2:00 p.m. at Timberlake Cemetery north and east of Helena. www.lanmanmemorials.com Facebook: Lanman Funeral Home Inc.